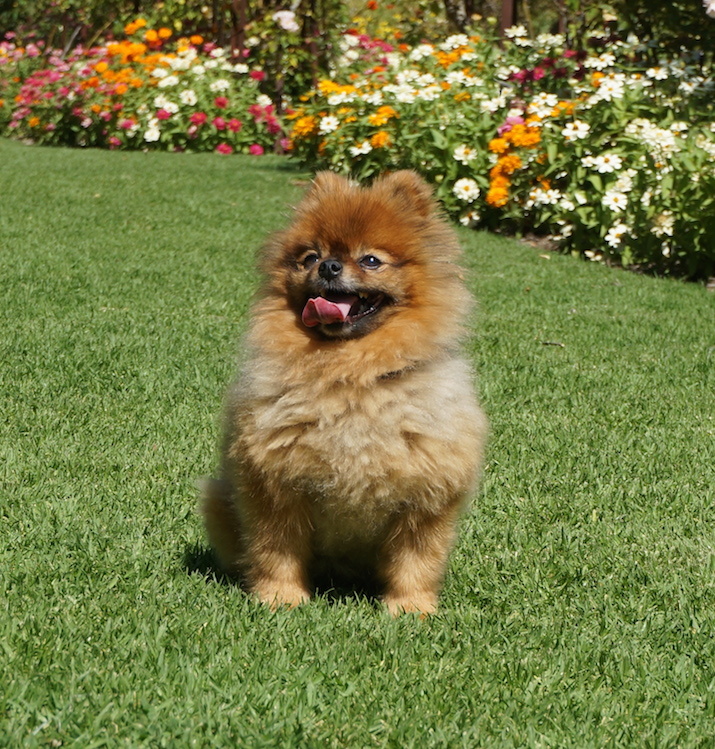 I’m often asked about the personality of Goochie, my 7-year-old Pomeranian. So I’ve partnered up with Ashleigh from The Pets Hotel to explain a Pomeranian’s temperament. Goochie at the Botanical Gardens in Melbourne. I was hoping he wouldn’t stick out his tongue this much but the little guy was feeling hot. The Pets Hotel have taken care of Goochie in the past. I’ll never forget the day I picked him from them and they told me he gave them a bit of attitude. I thought that was hilarious and I can only wonder from where he got his attitude from! Here is our list of different characteristics of Pomeranian’s temperament. Pomeranians need attention, especially if you are keeping them indoors with your family. You can’t expect to sit and read a book without them wanting to be in your lap. There is nothing worse than small kids running towards him with their hands out ready to pat. He HATES this. I try to limit this as much as I can by crouching down to his level and preparing him for the kids. I also tell them to come in slowly. That being said, Goochie has never nipped at a child. Make sure when kids approach your Pomeranian you have control of the dog. They do not like sudden movements and a small child running at them can frighten them. I probably pamper Goochie a bit too much and as a result, I know he doesn’t see me as a strong authority figure. When he wants attention or protection he always comes to me. But he is extremely affectionate to his ‘pack leader,’ my partner and the one who disciplines him more than I do. These little fur balls should not be kept outdoors. Due to their size, they require a small amount of exercise and can easily be toilet trained. Goochie has a distinct bark when he needs to go to the toilet, which he knows is outside. I live near open green areas by the water and I often take him for walks around the place. He is always outdoors and not stuck in the apartment. Due to the thickness of their coats, they need to be brushed at least twice a week. In summer time they often have to be trimmed because it’s too hot for them. We can notice the difference in their attitude when they have their coat trimmed in the warmer months; they feel a lot happier! Ashleigh tells me that some Pomeranians can be snappy around other dogs, as they have spent most of their lives only socialising with humans. This isn’t ideal as they don’t learn to socialise with dogs should eventuating in anxiety issues further down the line. So the best advice (even though you may think they are very precious and in many ways they are), is to let them play with other pets and don’t be OVER protective as this will just feed their aggression towards other pets and people. Hopefully, this information will assist you when making that final decision to own a Pomeranian. Growing up I always owned Corgi’s, Goochie is the first Pomeranian I’ve ever owned. Not comparing the two breeds because they are so different, but I would never give him up for the world. In fact, I am keen to find another one and enjoy meeting other Pomeranian owners. If you have any questions about Pomeranians feel free to get in touch.